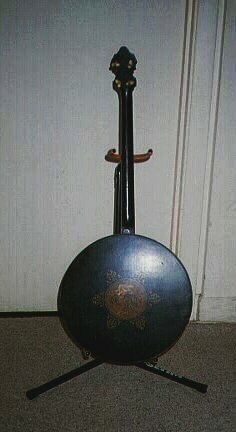 This is the front of my Banner Blue Tenor. She is pretty plain and has dot inlays at the 5th, 7th, 10th, and 12th frets. 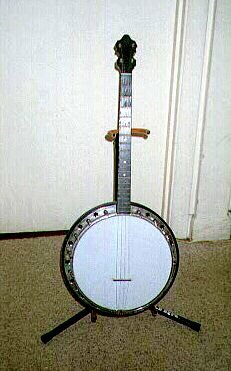 I believe it is the aluminum flange that surrounds the wooden rim that accounts for the banjo's loudness. It has little star cut-outs, which I think allow the sound to bounce off the resonator and shoot out at the audience. This banjo definitely cuts it whatever the reason. It is LOUD! Here is the back of the Banner Blue Tenor. It has what appears to be a decal of a branch with a bunch of flowers on it, with just one fully opened. Pretty funky eh? The tuners have plastic knobs. No ivory here...Looks like the neck may have been repainted black at some time. Not a collector's piece, but very playable just the same.